Are you coming back down to defend your title at the 2nd Annual Special Olympics Disc Golf Tournament??? 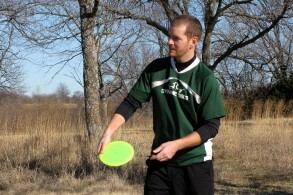 Rockin an ace in Oklahoma, Sweet! The wind was mean in Manhattan so it was probably just as bad in oklahoma. Wasn't too bad in Oklahoma. Maybe 10+mph?.. I popped a tomahawk over the trees and let the tailwind carry me up to the basket. I was intending to lay up, so I almost missed seeing it go in. Nice rounds you been throwing lately!!! Wish i could say the same but only getting to play like once every three weeks lately. Ga championships were pretty fun. Got to see Shusterick Throw a 36 at claystone with no ace runs. drained a 70ft downhill towards the lake on 17 to make that happen. I thought my 68 from the pro tees to long pins at bowden was good but then he threw a 50. Come back and play man. We miss ya around here. Nice rating by the way(956). Creeping up towards Pro are we? Thanks Mark... I wish I could have pulled off a win, but I'll take it either way with how rough of a start I had during the 3rd round. I had to string together 6 straight 2s to finish it up. Nice ace! Was it a pin placement that you could see or was it just that sweet sound? It was the short one to the right, just hidden by the crest of the hill... I threw a pretty steep hyzer and couldn't see the basket so I thought it spit out for sure, but it stuck! Zane, Have you moved yet? What courses have you been playing lately? Sorry to hear you've lost some prized firebirds. Too bad you don't live here anymore, you probably could have found a couple replacements at our HUGE DFOK swap meet yesterday. Ok, I've lost 3 11x firebirds in about a month.... If ANYONE can hook me up with a few, I will make it worth your time. I would also take any of the F2 firebirds (EXACTLY like the one in my profile pic) if I can't get a couple nice flat 11x birds. Uh oh! Something's in the air! Nice ace! When you coming back to town? We got Moon Lake up and running finally! Thank you sir! It was dead in the center of the heart of the chains! Congrats on your league win!!!!!!! Good job, what was the course like, does it compare to any course up here in kansas? how many people played in open? Took 3rd in the open division this weekend at the Herman C. Michael "Mayday Madness" tourney in Bishop, GA after a 5 hole playoff.... Had a great time! Thats it! Just asked my resident Kansas City native...the wife, haha. Place was awesome. Displaying 1-20 of 112 total board posts.